XIX All India Moot Competition 2015 – ULC Bangalore is one of the most prestigious mooting competitions in India. CRM Law School, Bangalore won the moot and National Law University, Odisha was placed second. The bench for the final rounds of the competition was presided over by Justice K L Manjunath , Judge, High Court of Karnataka, Justice Ram Mohan Reddy, Judge , High Court of Karnataka and Justice Huluvadi G. Ramesh , Judge, High Court of Allahabad and the other eminent jurists and academicians. The award for the BEST RESEARCHER went to Shubhangi Jain from NLU Bhopal. Congratulations for your achievement! Live Law : How do you feel after winning the best researcher award? How many days of hard work you did to accomplish this position? Shubhangi : The moot was a great learning experience. Being my first moot, I got to learn the basics of mooting and various aspects related thereto. I had targeted this award since the day I picked the moot. We spent months for the moot and I think that this award is the outcome of all those sincere efforts. This award is very encouraging for me and has motivated me to perform even better in my future endeavours. Live Law : What difference did you find inXIX All India Moot Competition 2015 as compared to other National Moot competition? Shubhangi : Despite of this being my first mooting experience I am well versed with the mooting culture. This competition carries a great reputation and is very helpful in exposing law students to various arenas of law. Overall the moot stands at par with other National Moot competitions. Live Law : What is the most important thing you learnt while preparing and doing the moot? Shubhangi : Being a researcher, I got to learn the various techniques involved in a good research. Further, I also came to know about drafting and formatting skills involved in preparation of memorials. Apart from these, I also learnt to establish logical connections between the stated facts and deduce desired results. I think that all these skills would be very helpful for me both at the academic level and also during my internship programmes. Live Law : What was the hardest part while preparing and mooting? Shubhangi : Since the memorial submissions clashed with college vacations we faced problems in co-ordinating with each other. Further, we had to juggle between our research and internship assignments. Further, our college being closed for winter vacations we had difficulty accessing the research materials and had to rely majorly on online materials. Live Law : At any point of time did of you feel of giving up? Shubhangi : Mooting is something which requires hard work and patience. In the beginning you face various problems. The first problem that usually arises in any moot is to decide the research strategy. Further, time management is another issue that needs to be taken care of. There are times when you find yourself nowhere and feel heavily burdened with all issues. Our team faced the same problem in this moot, however we, as a team never gave up. As we proceeded in our research, we started getting relevant material, and the research became interesting. Live Law : How did you prepare for the moot? What was your approach while preparing for this moot? Shubhangi : Moot proposition is the most important part of the moot. So firstly the entire team has to be well versed with the facts of the problem. We went through the factsheet a number of times and then started working on the issues. We divided the work accordingly between the team members and started researching on our respective issues followed by the drafting of the memorial. Live Law : After winning as the Best Researcher, would you like to change the pattern of your preparation? Shubhangi : The moot was a great learning experience. I learnt various valuable research techniques while preparing for the moot and would definitely employ them in my future research endeavours for a better output. Live Law : How much contribution you would like to give to your professor/ college over this achievement? Shubhangi : The professors and our seniors were very helpful and guided us throughout the moot. They proved to be a constant support by readily helping us with the legal issues in the moot problem. Live Law : How many other National Moot Competition have you participated and won? Shubhangi : This was my maiden moot court competition. Live Law : What area of law would you guys like to expertise? Have this moot change your mind set of in the area you would like to expertise? 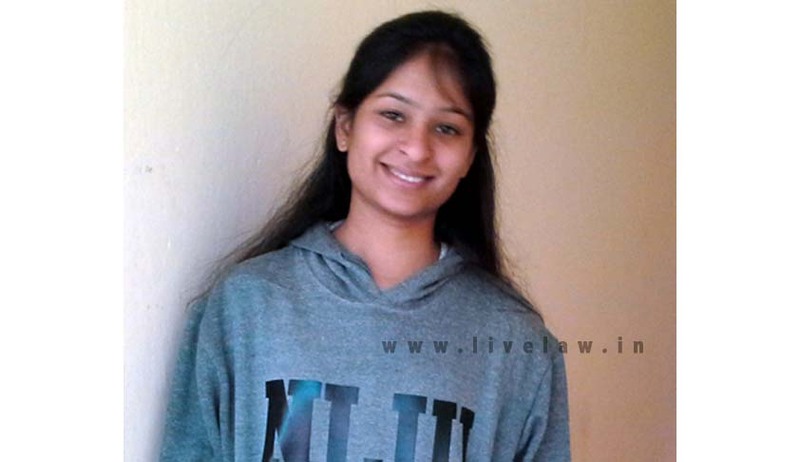 Shubhangi : Being in the third year of law college I am still exploring my area of expertise. However, based upon my past internship experiences I am more inclined towards Judiciary. Constitutional law being my favourite subject I would like to expertise in this area. This moot has exposed me to the practical dynamics involved in law and has boosted my decision. Live Law : How did you balance your academic or internship with the preparation of the moot? Shubhangi : I am a very organized person and like to give a quality output within the given timeframe. I started by preparing a time schedule devoting equal time to both moot and internship. This helped me in finishing all my assignments within the available deadlock and thus putting stress at bay. Live Law : What would you like to do after the law schools? Shubhangi : After completing my graduation I want to be part of the esteemed Judiciary of our country. This is because in my opinion a Judge plays a great role in framing and implementing laws. Live Law : How was it like working with the team? Were there any roadblocks? Shubhangi : The team was very cooperative and amicable. We had great co-ordination which helped us to give a quality output. Live Law : How many teams were you up against in the competition? Which team would you consider to be your toughest competition? Shubhangi : We were up against three teams. The team of NLUO gave us the toughest competition and was a really good team to which we lost in the quarter finals. Live Law : What message would you like to give to the mooters and the non- mooters? Shubhangi : I think intelligent hard work is the key to success. Apart from this patience, positive attitude and punctuality are three gems which can help an individual in adding feathers to his/her cap.